Time for another confession â€¦. I had to do something and started flipping boxes and kits in my small stash and on one side of the stash is my 48th scale jets; kit's I've wanted to build but never got around to. I thought, maybe now might just be the time; so why not, I'm certainly going absolutely no where now and time to the two contests is running out. So maybe, just maybe I would give it a try, go strictly Box Stock and see if I could cross the finish line before the first deadline. At least this might be the motivation I needed -who knows, as I've done a lot of strange things these past months and continue to do so . I've lived on Long Island almost my entire life, grew up 20 minutes from the Grumman plant in Bethpage and just about the same 20 minutes from the Republic plant in Farmingdale. Nothing has a softer place in my heart then the aircraft that came down their production lines. I do have a special place for Tomcats and 15 minutes from my home, is the Grumman Memorial Park with a gorgeous Tomcat on display. 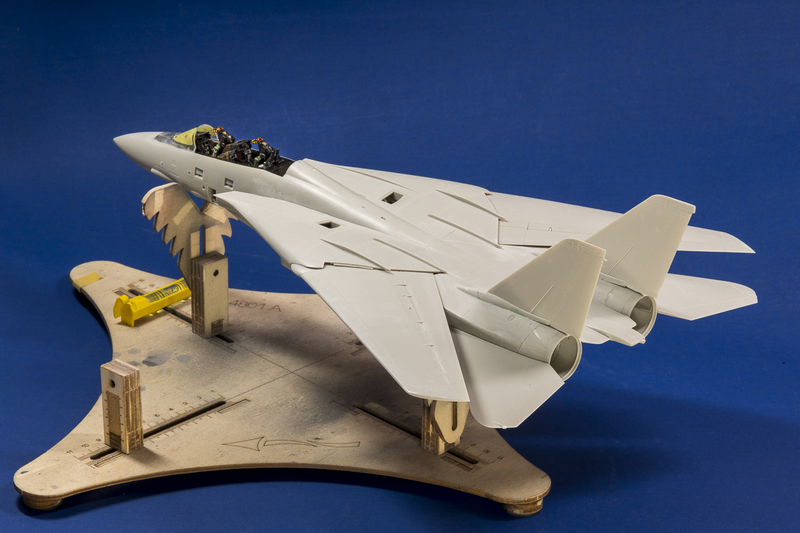 No more incentive was needed as I pas by a few times a week and I felt a kick in the rear to go for the Tamiya Tomcat and get into gear. Ready to cross the line. The basic build is done and I'm almost ready for priming. Yes, I've been at the build, put in enough time to maybe be finished for the Mosquitocon. I haven't taken any work in progress photos as I wanted to spend as much time at the bench as possible and not being large scale, I have been guessing the interest most likely for all the normal build stages isn't there. Tamiya hit the ball out of the park again; just a gorgeous kit, typical Tamiya quality and attention to detail. 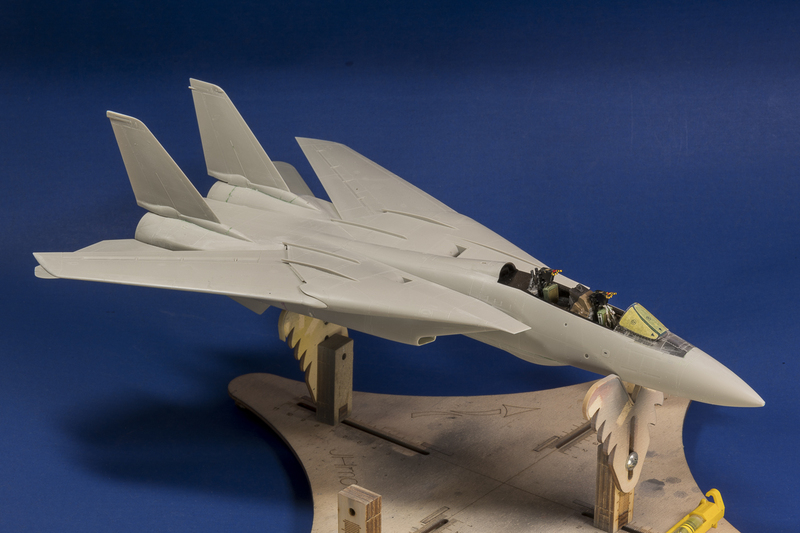 Contest rules for Box Stock allow zippo in AM except for decals and after a lot of thought, I going to be building an VF111 F-14A Tomcat: Miss Molly using the superb Furball Decals 48-060. So far, I've gone the full route in 'detail painting' and even a bit of weathering for this old boy! The nose gear wheel well is a work of art and a lot of time was spent detail painting, doing all the pistons and oleo's with Alclad Chrome and then Tamiya pin washes to bring out the details. The front office is amazing in it's own right and where it was possible to mask and air brush parts, that's what was done. 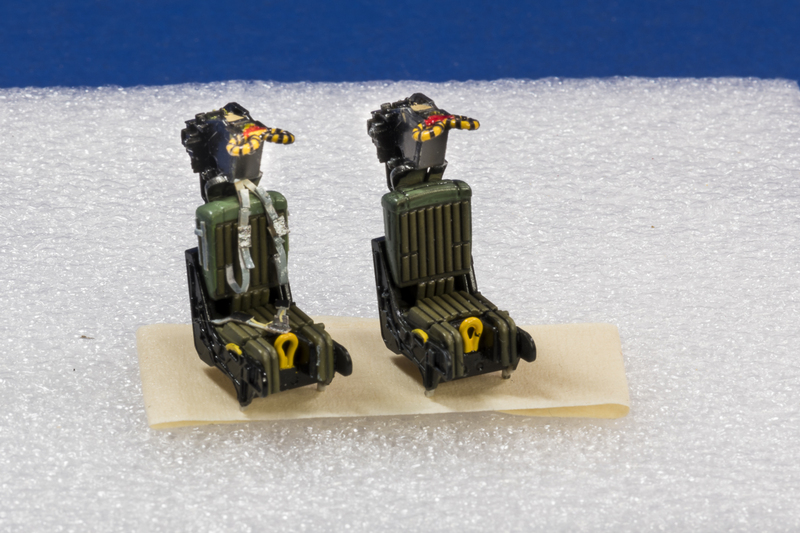 Tamiya GRU-7 seats are very good and since the rules allowed for simple masking tape belts, that's route I went again. I've finished the belts on just one of the seats and the other seat will be done while the primer is drying and then a bit of weathering to add a bit more life. Some poetic license was used for the belts and harnessed as I had to keep them simple and couldn't use any wire or metal buckles and latches I had in the spare parts box. 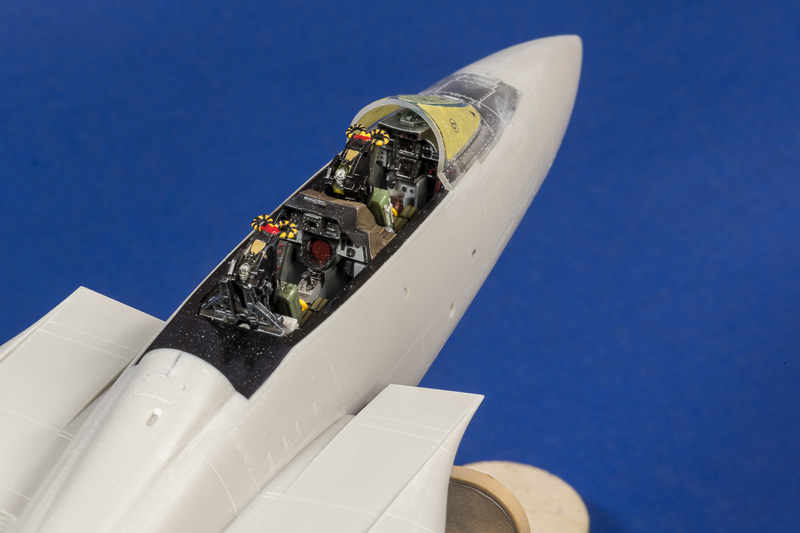 I've tried to match colors to the DACO F-14 Book by Danny Coreman and Tamiya while not perfect, has a gem for sure. 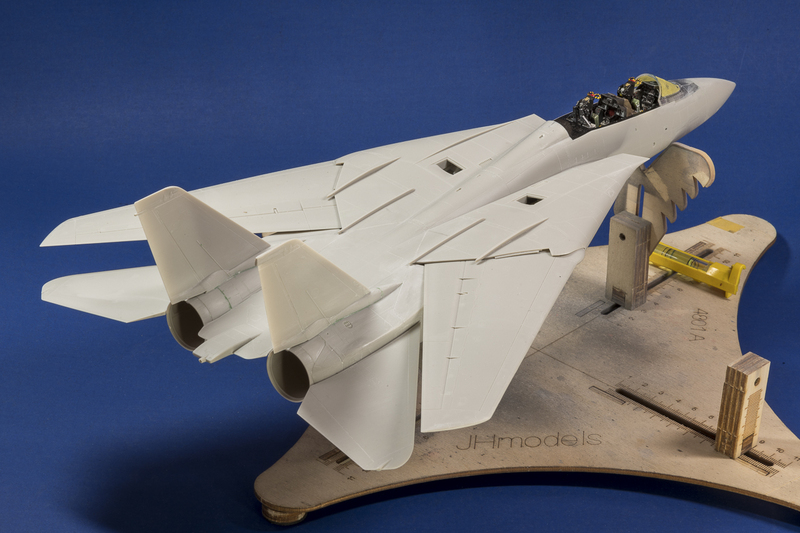 I'm glad Tamiya decided to leave the wings 'solid' and let the Hobby Bosses F-14 handle that avenue of detail. 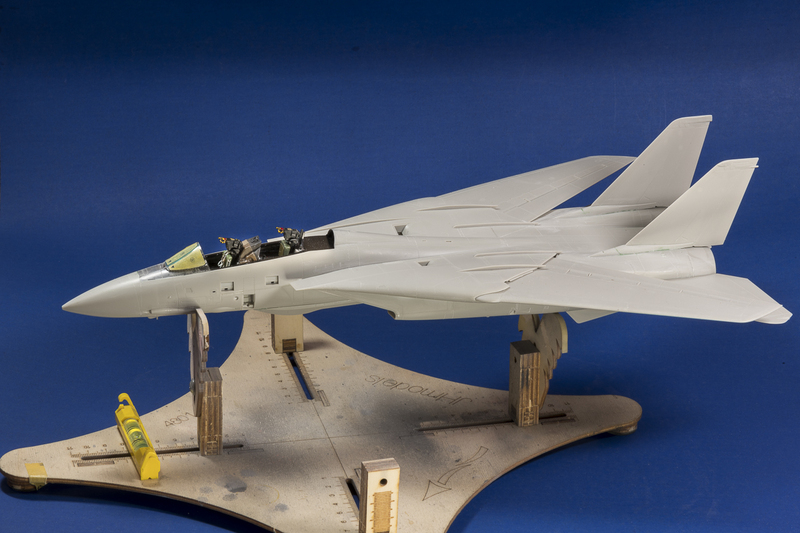 From the parts breakdown, an F-14D can't be too far behind. Not being an advocate of having panels open, I closed up the refueling probe assembly and the Pilot and RIO ladder and steps are still an undecided issue. She'll be armed with four Phoenix missiles, two Sidewinders, two Sparrows and two drop tanks. The wings at this point are removable and I'll have them off for painting. Well that's the story and that's the goal. Yes, I will finish the SBD down the road this summer but right now, I have my sights set on a few gems waiting in the wings. It would be nice to see this in person at MosquitoCon Peter. Here's hoping you get her finished in time. Some how when I was ready to post the thread, I couldn't find the NON LSP Forum. Can I pass it off as a senior moment? Very nice! I'm always glad to see another of your updates. Excellent work Peter, I have been eying this kit in my stash ever since I got it! How long has it taken you to get to this point in the build? Great work so far and the cockpit looks fantastic! Can't wait to see what you do with this one! And a change in what we build is sometimes what we need. My F-4E has been in the last stages of completion but I've been mostly working on a cyborg dinosaur lately so I know how you feel. It means I'm still at the bench enjoying my hobby which is more important to me and you too I would wager. Looks great! I definitely want to get one for the stash. Congrats for the decision you made.